Examples of knitting are not something you would expect to find amongst the brass, glass and grey metal boxes that make up a large chunk of the science collections. Yet, stored away in the National Museums Collection Centre are two pieces of knitted fabric created by the Scottish chemist and mathematician Alexander Crum Brown (1838-1922). 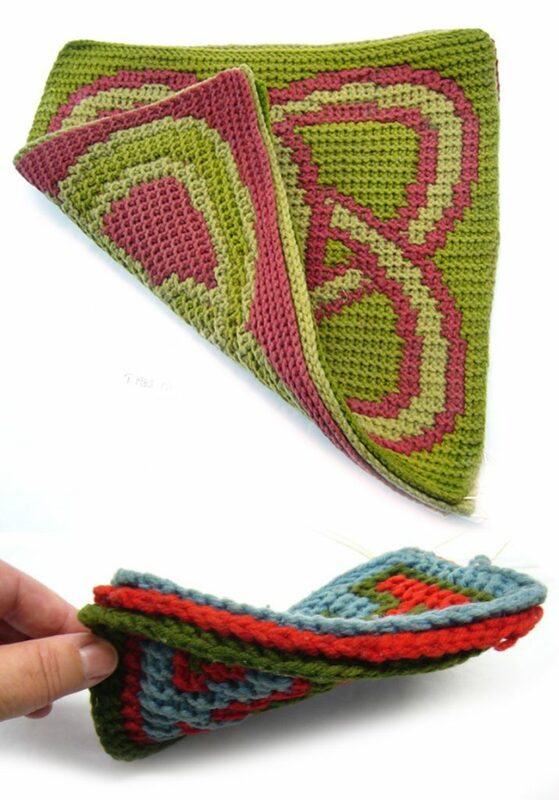 T.1983.192 – Triple layer knitting in 3 colours, ‘KH’ stands for kettle holder. 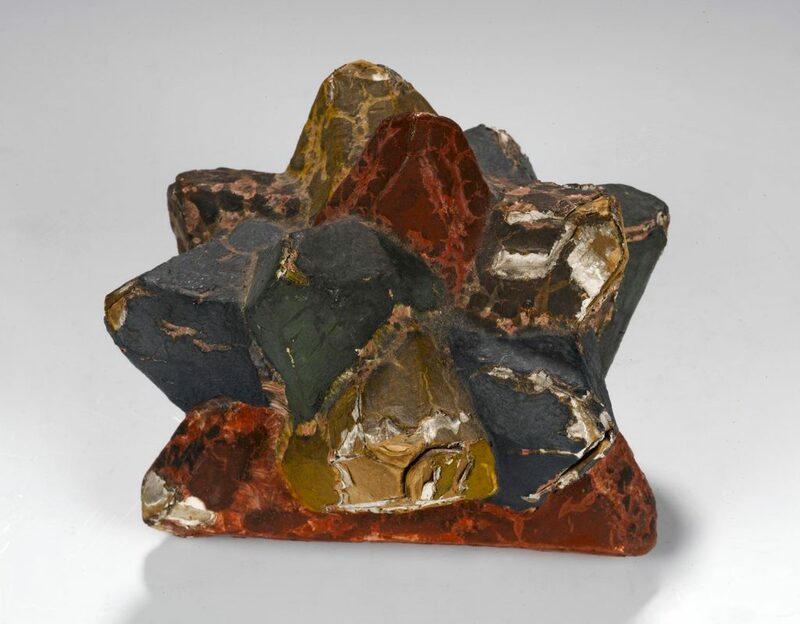 Throughout his career, Crum Brown (or ‘Crummie’ as he was fondly known by the male students who attended his raucous chemistry lectures at Edinburgh University), created models of mathematical or crystal shapes using leather, papier mache, plaster of Paris, and wool to illustrate his research. 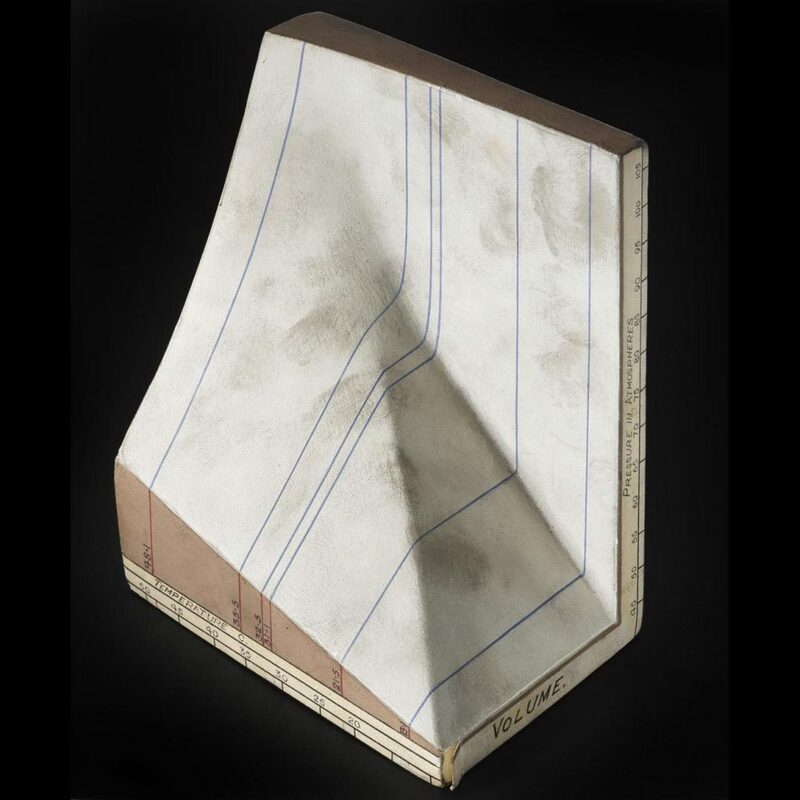 T.1988.1 – Mathematical model of cardboard covered plaster of Paris in colours, made by Alexander Crum Brown. T.1999.301 Thermodynamic model by James Clerk Maxwell from Josiah Gibbs’ equations, Cambridge, England, c1875 formerly owned by George Chrystal and Alexander Crum Brown. 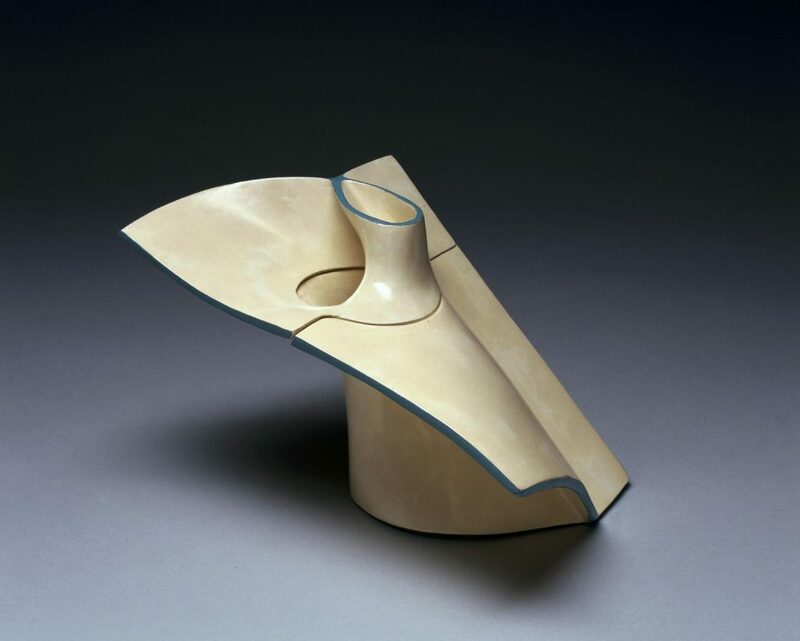 As well as making his own models, Crum Brown also collected the work of others. His model of Maxwell’s Thermodynamic Surface, made by James Clerk Maxwell which is on display in Enquire came to us via the Natural Philosophy department of Edinburgh University. The model illustrating Professor Andrews’ experiments on the relation between the pressure, volume and temperature of carbonic acid is one of three models donated to the museum by Alexander Crum Brown himself. T.1910.28 The states of carbon dioxide. This is an example of the first 3D graph to show the volume, temperature and pressure of carbon dioxide gas and when it becomes liquid. By James Thomson from Thomas Andrews’ data, Belfast, Ireland 1862-71, presented to the museum by Alexander Crum Brown. In his 1861 MD Thesis entitled “On the Theory of Chemical Combination”, Crum Brown was the first to use a graphic representation of organic molecules to show the chemical position of atoms. He represented each atom as a letter inside a circle which were then connected to each other with solid lines. With only small changes, this method of representing molecules is still in use today. 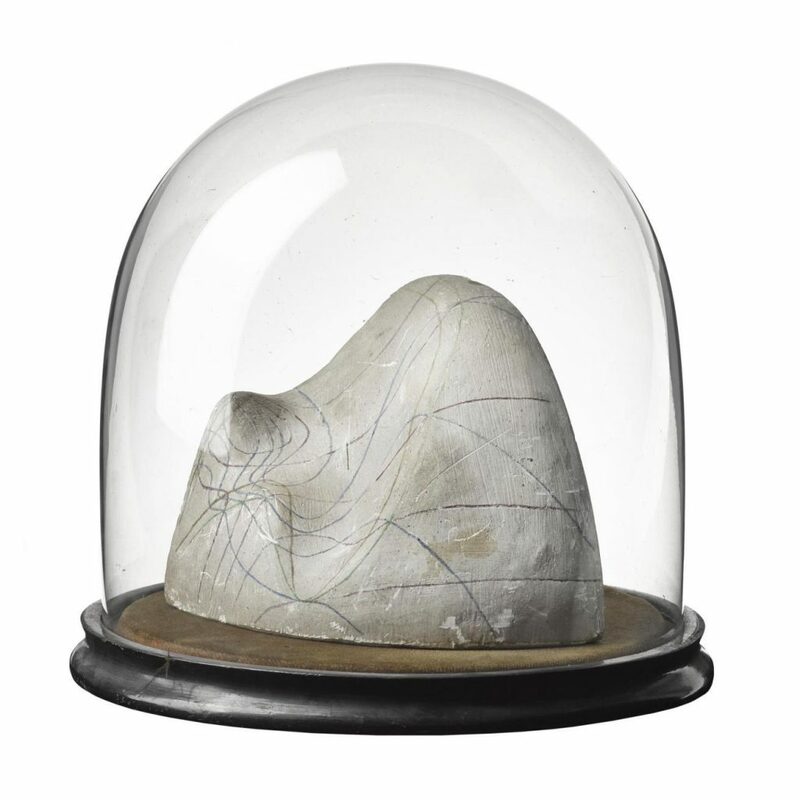 Model of rock salt molecule, 1883, Alexander Crum Brown © The University of Edinburgh. There are examples of Crum Brown’s models in a number of institutions across the UK. 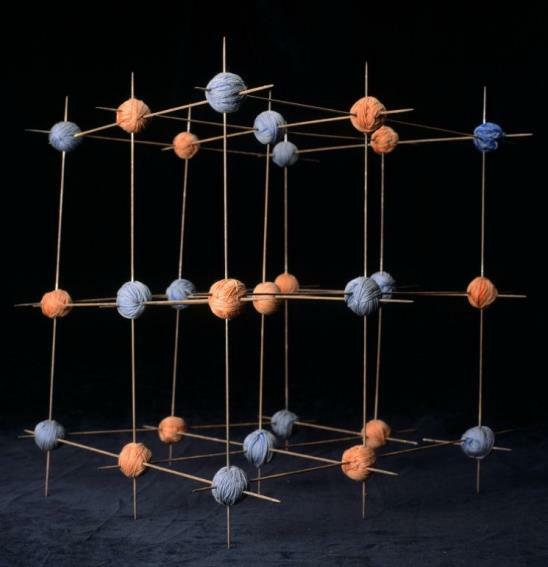 This early example of a ‘ball and stick’ model of a rock salt molecule – created using balls of red and blue yarn and steel knitting needles – is in the Chemistry collections at Edinburgh University. Model of a half-twist surface. Alexander Crum Brown (1838-1922), Science Museum Group Collection © The Board of Trustees of the Science Museum. Further examples of his models, demonstrating his work on interlacing and interpenetrating surfaces, can be seen in the collections of the Science Museum. 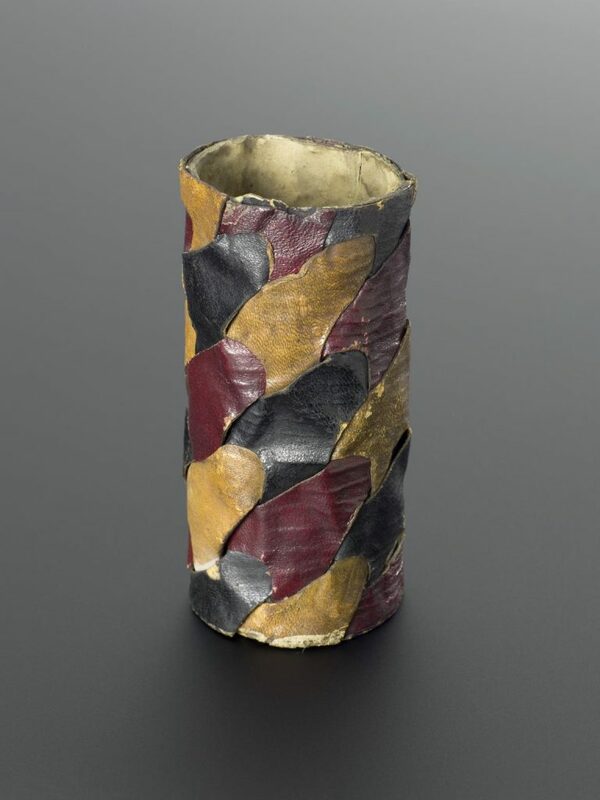 Locked cylinder of three interlacing sheets by Alexander Crum Brown, c.1914. Science Museum Group Collection © The Board of Trustees of the Science Museum. 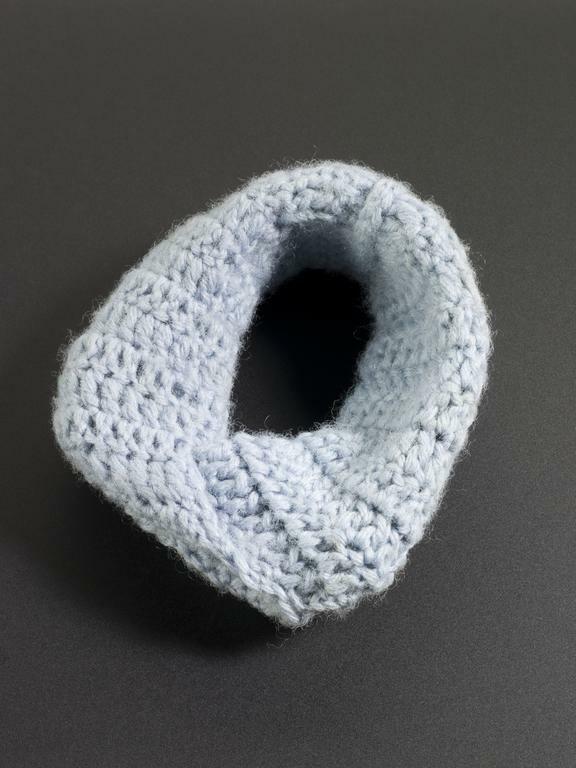 Klein bottle in light blue wool by Alexander Crum Brown c.1900. There are further knitted models are in the Whipple Museum of the History of Science collections. My personal favourite is this set of oak and ivory knitting needles in the care of the Science Museum. I bet they are a dream to work with! 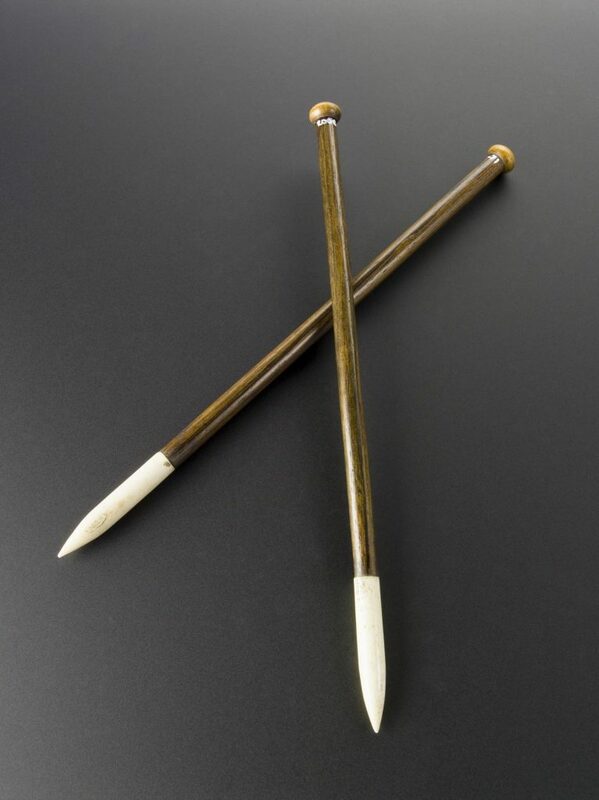 Knitting needles used by Alexander Crum Brown to produce mathematical models, c.1900. Science Museum Group Collection © The Board of Trustees of the Science Museum. David Dunning, a science historian, came to look at our models a number of years ago. 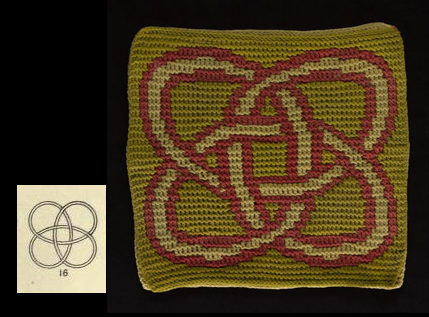 In his subsequent essay, he wrote that Crum Brown’s knitted models not only illustrate his own research on surfaces but also the work of others, in particular, Crum Brown’s colleague and brother-in-law Prof Peter Guthrie Tait (1831-1901). In the essay, Tait attempted to create a classification of knots based on the number of their crossings and their levels of ‘beknottedness’ – basically a description of the complexity of the knot and the number of times that it is necessary to pass one part of the curve of the knot through another in order to untie the knot. Plate IV. of ‘On Knots’ published by the Transactions of the Royal Society of Edinburgh in 1877, Prof Peter Guthrie Tait. 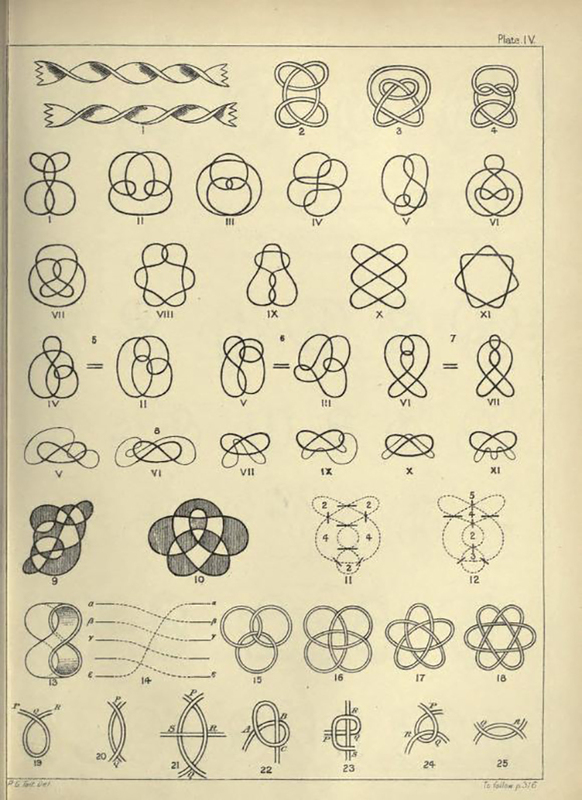 Examples of these various knots are illustrated in Plate IV. If you look at the knot labelled number 16, you’ll see it is identical to the design featured on the largest of our knitted models. Knot number 16, from Plate IV illustrated above. Shown next to Triple layer knitting in three colours by Alexander Crum Brown. So we know who made the models and what they were used for but the question that I kept coming back to was how on earth were they made? As you can see from the photographs, the models consist of three layers of knitted fabric that have been constructed in such a way that the colours appear in a different section of the design in each layer. When I first looked at the models I thought they were created using a variation of the Double Crochet stitch or were perhaps an example of Tunisian Crochet, but I just couldn’t work out how the three layers of fabric were joined together. I mentioned the models in a casual conversation with Ruth Churchman – a talented knitter who works at National Museums Scotland and brought them up to Chambers Street for Ruth to inspect and hopefully enlighten me on their construction. Ruth did not disappoint and will now introduce you to the wonderful world of mathematical knitting in part two of this blog.